This article is about the album. For the song, see Back to Black (song). For the documentary film, see Amy Winehouse: Back to Black. Not to be confused with Back in Black. Back to Black is the second and final studio album by English singer and songwriter Amy Winehouse. It was released on 27 October 2006 by Island Records. The album spawned five singles: "Rehab", "You Know I'm No Good", "Back to Black", "Tears Dry on Their Own" and "Love Is a Losing Game". Back to Black was acclaimed by music critics, who praised Winehouse's songwriting and emotive singing style as well as Salaam Remi and Mark Ronson's production. At the 50th Annual Grammy Awards ceremony, Back to Black won Best Pop Vocal Album and was also nominated for Album of the Year. At the same ceremony, Winehouse won four additional awards, tying her with five other artists as the second-most awarded female in a single ceremony. The album was also nominated at the 2007 Brit Awards for MasterCard British Album and was shortlisted for the 2007 Mercury Prize. Back to Black sold 3.58 million copies in the UK alone, becoming the UK's second best-selling album of the 21st century. The album has sold over 12 million copies worldwide. 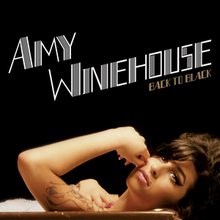 A deluxe edition of Back to Black was released in November 2007, containing a bonus disc of B-sides, rare, and live tracks. Winehouse's debut DVD I Told You I Was Trouble: Live in London, released that same month, includes a live set recorded at Shepherd's Bush Empire in London and a 50-minute documentary detailing the singer's career over the previous four years. Winehouse released her debut album, Frank, on 20 October 2003. Produced mainly by Salaam Remi, many songs were influenced by jazz, and apart from two covers, every song was co-written by Winehouse. The album received positive reviews with compliments over the "cool, critical gaze" in its lyrics and brought comparisons of her voice to Sarah Vaughan, Macy Gray and others. The album reached number 13 on the UK Albums Chart at the time of its release, and was eventually certified triple Platinum by the British Phonographic Industry (BPI). In 2004, Winehouse was nominated for British Female Solo Artist and British Urban Act at the Brit Awards, while Frank made the shortlist for the Mercury Prize. That same year, the album's first single, "Stronger Than Me", earned Winehouse and Remi an Ivor Novello Award for Best Contemporary Song. In contrast to her jazz-influenced debut album Frank, Winehouse's focus shifted to the girl groups of the 1950s and 1960s. Winehouse hired New York singer Sharon Jones's longtime band, the Dap-Kings, to back her up in the studio and on tour. Mitch Winehouse relates in Amy, My Daughter how fascinating watching her process was: her perfectionism in the studio and how she would put what she had sung on a CD and play it in his taxi outside to know how most people would hear her music. In May 2006, Winehouse's demo tracks such as "You Know I'm No Good" and "Rehab" appeared on Mark Ronson's New York radio show on East Village Radio. These were some of the first new songs played on the radio after the release of "Pumps" and both were slated to appear on her second album. The 11-track album, completed in five months, was produced entirely by Salaam Remi and Ronson, with the production credits being split between them. Ronson said in a 2010 interview that he liked working with Winehouse because she was blunt when she did not like his work. She in turn thought that when they first met, he was a sound engineer and that she was expecting an older man with a beard. Tom Elmhirst, who remixed the single "You Know I'm No Good", was enlisted to help with the mixing of the album. He first received Ronson's original mix, which he described as being "radical in terms of panning, kind of Beatlesque. The drums, for instance, were all panned to one side." He attempted to mix "Love Is a Losing Game" in the same manner he did with "Rehab", but he felt it was not right. The majority of the songs produced by Ronson were done at the studio of the band the Dap-Kings, in Brooklyn, New York. The drums, piano, guitar and bass were all done together in one room, with the drums being recorded with one microphone, with lots of spill between the instruments. Elmhirst mixed "Rehab"; when he first received the multitrack of the song it was small, but Ronson then went to London to record strings, brass and percussion in one of Metropolis Studios's tracking rooms. After this was added, there were quite a few tracks. The song had a retro, 1960s soul, R&B feel, which is what the Dap-Kings specialise in, when it came to the mixing Elmhirst added a contemporary feel to it as well, while Ronson wanted to keep the mix sparse and not overproduced. According to AllMusic's John Bush, Back to Black finds Winehouse "deserting jazz and wholly embracing contemporary R&B". David Mead of Paste also viewed it as a departure from Frank and said that it sets her singing to Salaam Remi and Mark Ronson's "synthetic Motown-style backdrop". Meanwhile, Ann Powers from NPR Music characterised Back to Black as "a full embrace of classic rhythm and blues." Music journalist Chuck Eddy credits Ronson and Remi's production for resembling Phil Spector's Wall of Sound technique and surrounding Winehouse with brass and string sections, harp, and the Wurlitzer. PopMatters writer Christian John Wikane said that its "sensibilities of 1960s pop and soul" are contradicted by Winehouse's "blunt" lyrics and felt that "this particular marriage of words and music mirrors the bittersweet dichotomy that sometimes frames real relationships". The staff of The A.V. Club emphasized on "the record's status as the pinnacle of the Brit neo-soul wave it ushered in". The song "Tears Dry on Their Own" samples the main chord progression from Marvin Gaye and Tammi Terrell's 1967 song "Ain't No Mountain High Enough". On the song "Rehab", Winehouse mentions "Ray" and "Mr. Hathaway", in reference to Ray Charles and Donny Hathaway. However, for some time during live performances, she replaced "Ray" with "Blake", referring to her ex-husband, Blake Fielder-Civil, who served time in prison for charges relating to grievous bodily harm. "Back to Black" explores elements of old-school soul music. The song's sound and beat have been described as similar to vintage girl groups from the 1960s. Its production was noted for its Wall of Sound. Winehouse expresses feelings of hurt and bitterness for a boyfriend who has left her; however, throughout the lyrics she "remains strong" exemplified in the opening lines, "He left no time to regret, Kept his d_ck [sic] wet, With his same old safe bet, Me and my head high, And my tears dry, Get on without my guy". The song's lyrical content consists of a sad goodbye to a relationship with the lyrics being frank. John Murphy of musicOMH compared the song's introduction to the Martha and the Vandellas song "Jimmy Mack", adding that it continues to a "much darker place". A deluxe edition of Back to Black was released in mainland Europe in November 2007 and in the United Kingdom on 3 December 2007. The reissue features the original studio album remastered as well as a bonus disc containing various B-sides, rare, and live tracks, including Winehouse's solo rendition of the single "Valerie" on BBC Radio 1's Live Lounge; the song was originally available in studio form on Ronson's Version album. Winehouse's debut DVD I Told You I Was Trouble: Live in London was released in the UK on 5 November and in the US on 13 November. It includes a live set recorded at London's Shepherd's Bush Empire and a 50-minute documentary chronicling the singer's career over the previous four years. The first single released from the album on 23 October 2006 was "Rehab", a song about Winehouse's past refusal to attend an alcohol rehabilitation centre despite prodding by her management company. On 22 October 2006, based solely on download sales, it entered the UK Singles Chart at number 19, and when the physical single was released the following week, it climbed to number seven. Following a performance of "Rehab" at the 2007 MTV Movie Awards on 3 June 2007, the song rose to number 10 on the US Billboard Hot 100 for the week of 23 June, peaking at number nine the following week. "You Know I'm No Good" was released on 8 January 2007 as the album's second single, reaching number 18 on the UK Singles Chart. Back to Black was released in the United States in March 2007, with a remix of "You Know I'm No Good" featuring rap vocals by Ghostface Killah as its lead single. A third UK single, "Back to Black", was released on 30 April 2007. Having previously peaked at number 25 on the UK chart, the track climbed to number eight in late July 2011, following Winehouse's death. Two further singles were released from the album: "Tears Dry on Their Own" was released on 13 August 2007, and peaked at number 16 in the UK, while "Love Is a Losing Game", released on 10 December 2007, reached number 33. Winehouse promoted the release of Back to Black with headline performances in September and November 2006, including a Little Noise Sessions charity concert at the Union Chapel in Islington, London. On 31 December 2006, Winehouse appeared on Jools Holland's Annual Hootenanny and performed a cover of Marvin Gaye's "I Heard It Through the Grapevine" along with Paul Weller and Holland's Rhythm and Blues Orchestra. She also performed Toots and the Maytals' "Monkey Man". She began a run of another 14 gigs beginning in February 2007. At his request, actor Bruce Willis introduced Winehouse before her performance of "Rehab" at the 2007 MTV Movie Awards in Universal City, California, on 3 June 2007. During the summer of 2007, she performed at various festivals, including Glastonbury Festival, Lollapalooza in Chicago, Belgium's Rock Werchter and Virgin Festival in Baltimore. In November 2007, the opening night of a 17-date tour was marred by booing and walkouts at the National Indoor Arena in Birmingham. A critic for the Birmingham Mail said it was "one of the saddest nights of my life [...] I saw a supremely talented artist reduced to tears, stumbling around the stage and, unforgivably, swearing at the audience." Other concerts ended similarly, with, for example, fans at her Hammersmith Apollo performance saying that she "looked highly intoxicated throughout", until she announced on 27 November 2007 that her performances and public appearances were cancelled for the remainder of the year, citing her doctor's advice to take a complete rest. A statement issued by concert promoter Live Nation blamed "the rigours involved in touring and the intense emotional strain that Amy has been under in recent weeks" for the decision. Mitch Winehouse wrote about her nervousness before public performances in his 2012 book, Amy, My Daughter. Back to Black received widespread acclaim from critics. At Metacritic, which assigns a normalised rating out of 100 to reviews from mainstream publications, the album received an average score of 81, based on 26 reviews. AllMusic writer John Bush lauded Winehouse's musical transition from her debut record: "All the best parts of her musical character emerge intact, and actually, are all the better for the transformation from jazz vocalist to soul siren." Q magazine said she "now has a voice brimming with womanly promise." Dorian Lynskey of The Guardian called Back to Black "a 21st-century soul classic". Sal Cinquemani of Slant Magazine said that Winehouse and her producers are "expert mood-setters or crafty reconstructionists". Victoria Segal from The Times stated "these are explicit, honest songs ... from a thoroughly modern milieu". The Observer's Stuart Nicholson said the record succeeds because of "clever melody lines and smart lyrics". Jon Pareles of The New York Times called the album "a wonderfully time-twisted batch of songs", while Andy Gill hailed its "rejection of genre clichés". The New Yorker's Sasha Frere-Jones praised Winehouse's "mush-mouthed approach" and "range and delivery". Nathan Rabin, writing in The A.V. Club, was impressed by "the incongruity between Winehouse's trifling lyrical concerns and Back To Black's wall-of-sound richness". Entertainment Weekly's Will Hermes felt that her "smartass, aching, flirty, and often straight-up nasty" lyrics "raise this expertly crafted set into the realm of true, of-the-minute originality". In a mixed review, Rolling Stone's Christian Hoard stated: "The tunes don't always hold up. But the best ones are impossible to dislike." Robert Christgau gave it an "honorable mention" in his consumer guide for MSN Music, citing "You Know I'm No Good" and "Rehab" as highlights and writing, "Pray her marriage lasts—she's observant, and it would broaden her perspective". Pitchfork critic Joshua Klein criticised Winehouse's "defensive", subjective lyrics concerning relationships, but added that "Winehouse has been blessed by a brassy voice that can transform even mundane sentiments into powerful statements". Douglas Wolk, writing for Blender, said that the album "sounds fantastic—partly because the production nails sample-ready '60s soul right down to the drum sound; and partly because Winehouse is one hell of an impressive singer, especially when she's not copping other people's phrasing". In a retrospective review for Rolling Stone in 2010, Wolk gave the album four-and-a-half out of five stars and referred to it as "an unlikely marvel, a desperately sad and stirring record whose hooks and production (by Remi and Mark Ronson) are worthy of the soul hall-of-famers she namedrops—'Tears Dry On Their Own' is basically 'Ain't No Mountain High Enough' recast as self-recrimination". Back to Black was named one of the 10 best albums of 2006 and 2007 by several publications on their year-end albums lists, including The Austin Chronicle (number four), Billboard (number three), Blender (number eight), Slant Magazine (number four), Entertainment Weekly (number two), The New York Times (number three) and Time (number one). The album was placed at number 40 on Rolling Stone's list of The Top 50 Albums of 2007. Entertainment Weekly critic Chris Willman named Back to Black the second best album of 2007, commenting that "Black will hold up as one of the great breakthrough CDs of our time." He adds, "In the end, the singer's real-life heartache over her incarcerated spouse proves what's obvious from the grooves: When this lady sings about love, she means every word." Rolling Stone's list of the 100 Best Albums of the 2000s ranked the album number 20. In 2012, Rolling Stone ranked the album at number 451 on its list of The 500 Greatest Albums of All Time. The album was also included in the book 1001 Albums You Must Hear Before You Die. At the 2007 Brit Awards, Winehouse won British Female Solo Artist, and Back to Black was nominated for MasterCard British Album. In July 2007, the album was shortlisted for the 2007 Mercury Prize, but lost out to Klaxons' Myths of the Near Future. This is the second time Winehouse has been nominated for the Mercury Prize; her debut album Frank was shortlisted in 2004. Back to Black won numerous awards at the 50th Annual Grammy Awards on 10 February 2008, including Record of the Year and Song of the Year for "Rehab"; while the album received nominations for Album of the Year and Best Pop Vocal Album, winning the latter. Winehouse herself, for the album, was presented the Grammy for Best New Artist, while Ronson earned the 2008 Grammy Award for Producer of the Year, Non-Classical. Back to Black debuted at number three on the UK Albums Chart on 5 November 2006 with first-week sales of 43,021 copies. The album fell to number 10 the following week, selling 27,763 copies. By the end of 2006, the album had been certified Platinum by the British Phonographic Industry (BPI). Back to Black topped the UK Albums Chart for the first time during the week ending 20 January 2007, its 11th week on the chart, selling over 35,500 copies. The following week, the album remained at number one with nearly 48,000 copies sold. Five weeks later, it returned for a third week atop the UK chart, selling 47,000 copies. The deluxe edition of the album also spent a week atop the UK chart for the week ending 8 March 2008 with 62,773 copies sold, its 17th week on the chart after entering at number 22. In doing so, Winehouse became the first artist to top the chart with separate regular and deluxe editions of the same album. The two versions of the album charted separately at the time and were both in the top 10 for the week ending 29 December 2007. As of 14 June 2009, the album was the 18th highest-selling album of all time in the UK, with all versions combined. Back to Black was the biggest-selling album of 2007 in the UK, having sold 1.85 million copies. The BPI certified the album 13-times Platinum on 30 March 2018, and by October 2018, it had sold 3.93 million copies, making it the UK's second best-selling album of the 21st century behind Adele's 21, as well as the 13th best-selling album in the UK of all time. Back to Black debuted at number seven on the Billboard 200 in the United States with first-week sales of 51,000 copies, becoming the highest debut entry for an album by a British female solo artist at the time—a record that would be broken by Joss Stone's Introducing Joss Stone, which debuted at number two on the Billboard 200 the following week. Following Winehouse's multiple wins at the 50th Annual Grammy Awards, the album jumped from number 24 to a new peak of number two on the Billboard 200 chart issue dated 1 March 2008 with sales of 115,000 copies, a 368% increase from the previous week. The album was certified Platinum by the Recording Industry Association of America (RIAA) on 10 July 2007 for shipments in excess of one million units, becoming the 24th best-selling album of 2007. It was eventually certified double Platinum on 12 March 2008, and has since sold nearly three million copies in the US. Back to Black topped the European Top 100 Albums chart for 13 non-consecutive weeks, while reaching number one in Austria, Belgium, Croatia, Denmark, Germany, Greece, Ireland, Italy, Netherlands, Norway, Poland, Portugal, Spain and Switzerland. The album was certified eight-times Platinum by the International Federation of the Phonographic Industry (IFPI) in late 2011, denoting sales of eight million copies across Europe. As of November 2010, it was the fifth most downloaded album of all time in Germany. By April 2013, the album had sold over 12 million copies worldwide. Following Winehouse's death on 23 July 2011, sales of Back to Black drastically increased across the world. The album rose to number one on several iTunes charts worldwide. On 24 July 2011, with fewer than seven hours sales after the announcement of her death counting towards the respective week's chart figures, the original album re-entered the UK Albums Chart at number 49 with 2,446 copies sold, while the deluxe edition sold 843 copies to re-enter the chart at number 163. The following week, it soared back to number one, marking the fourth time the album had reached the top of the chart. Back to Black held the top spot for two additional weeks, selling 63,071 copies in the second week and 43,726 copies in the third week. On 26 July 2011, Billboard reported that the album had re-entered the Billboard 200 chart dated 6 August 2011 at number nine with sales of 37,000 copies, although that week's chart only tracked the first 36 hours of sales after her death was announced. The following week, it climbed to number seven with 38,000 copies sold after a full week's worth of sales. In Canada, the album re-entered the Canadian Albums Chart at number 13 on sales of 2,500 copies, an increase of 2,172% from the previous week. It rose to number six the following week, selling an additional 5,000 copies. In continental Europe, Back to Black returned to the number-one spot in Austria, Croatia, Germany, the Netherlands, Poland and Switzerland, while reaching number one for the first time in Italy. After the release of Back to Black, record companies sought out female artists with a similar sound and fearless and experimental female musicians in general. Adele and Duffy were the second wave of artists with a sound similar to Winehouse's. A third wave of female musicians that has emerged since the album was released are led by V V Brown, Florence and the Machine, La Roux and Little Boots. In March 2011, the New York Daily News ran an article attributing the continuing wave of British female artists that have been successful in the United States to Winehouse and her absence. Spin magazine music editor Charles Aaron was quoted as saying, "Amy Winehouse was the Nirvana moment for all these women [...] They can all be traced back to her in terms of attitude, musical styles or fashion." According to Keith Caulfield, chart manager for Billboard, "Because of Amy, or the lack thereof, the marketplace was able to get singers like Adele, Estelle and Duffy [...] Now those ladies have brought on the new ones, like Eliza Doolittle, Rumer and Ellie [Goulding]." 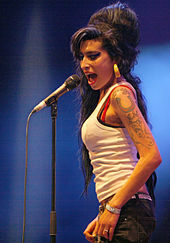 In late 2018, a documentary film based on Back to Black, titled Amy Winehouse: Back to Black, was released. It contains new interviews, as well as archival footage. It was made by Eagle Vision, produced by Gil Cang, and released on DVD on 2 November 2018. The film features interviews by producers; Mark Ronson & Salaam Remi who worked half and half on the album, along with the Dap-Kings, Remi's music team, singer from The Ronettes, Ronnie Spector and close friends of Winehouse; including Nick Shymansky, Juliette Ashby & Dionne Bromfield. The film is accompanied by An Intimate Evening in London, footage of a show Winehouse gave at Riverside Studios, London in 2008. 7. "Tears Dry on Their Own"
10. "He Can Only Hold Her"
12. "Close to the Front"
"Addicted" is only included on UK and Irish pressings of the standard album, while appearing as a bonus track on all deluxe editions of the album. "Tears Dry on Their Own" contains a sample interpolation of "Ain't No Mountain High Enough" written by Nickolas Ashford and Valerie Simpson. "He Can Only Hold Her" contains a sample interpolation of "She's a Fox Now" written by Richard and Robert Poindexter. Credits adapted from the liner notes of Back to Black. ^ "Amy Winehouse: Frank". Google. Archived from the original on 9 November 2007. Retrieved 27 April 2013. ^ Lindon, Beccy (17 October 2003). "Amy Winehouse, Frank". The Guardian. Retrieved 6 January 2014. ^ a b Bush, John. "Frank – Amy Winehouse". AllMusic. Retrieved 27 April 2013. ^ Boraman, Greg (27 November 2003). "Review of Amy Winehouse – Frank". BBC Music. Retrieved 18 February 2014. ^ "Official Albums Chart Top 100". Official Charts Company. 1–7 February 2004. Retrieved 12 March 2015. ^ "British certifications – Amy Winehouse – Frank". British Phonographic Industry. 19 December 2008. Retrieved 17 January 2015. Type Frank in the "Search BPI Awards" field and then press Enter. ^ "Brits 2004: The winners". BBC News. 17 February 2004. Retrieved 17 January 2015. ^ a b "Ferdinand win Mercury Music Prize". BBC News. 8 September 2004. Retrieved 17 January 2015. ^ "ASCAP Members Honored At The Ivors". American Society of Composers, Authors and Publishers. 2004. Retrieved 17 January 2015. ^ Sisario, Ben (29 September 2007). "She's Not Anybody's Backup Act". The New York Times. Retrieved 27 April 2013. ^ Topping, Alexandra (8 June 2010). "Mark Ronson gets all new romantic with Duran Duran". The Guardian. Retrieved 6 January 2014. ^ Tingen, Paul (August 2007). "Secrets Of The Mix Engineers: Tom Elmhirst". Sound on Sound. Retrieved 9 August 2016. ^ a b c Bush, John. "Back to Black – Amy Winehouse". AllMusic. Retrieved 21 January 2011. ^ Mead, David (23 April 2007). "Amy Winehouse – Back To Black". Paste. Retrieved 22 June 2013. ^ Powers, Ann (23 July 2011). "Remembering Retro-Soul Singer Amy Winehouse". NPR Music. Retrieved 17 June 2015. ^ Eddy, Chuck (1 April 2011). "Wall of Sound". Spin. New York. Retrieved 7 February 2016. ^ Wikane, Christian John (12 March 2007). "Amy Winehouse: Back to Black". PopMatters. Archived from the original on 21 October 2013. Retrieved 13 June 2010. ^ "The best music of the decade". The A.V. Club. 19 November 2009. Retrieved 26 August 2018. ^ du Lac, J. Freedom (13 March 2007). "That Winehouse Buzz? Believe It". The Washington Post. Retrieved 24 March 2008. ^ Farley, Christopher John (9 May 2007). "A New British Invasion?". The Wall Street Journal. Retrieved 26 August 2018. ^ a b Murphy, John. "Amy Winehouse – Back To Black". musicOMH. Retrieved 26 September 2014. ^ a b "Amy Winehouse, 'Back to Black' – 100 Best Songs of the 2000s". Rolling Stone. 17 June 2011. Retrieved 26 August 2018. ^ a b Myers, Justin (6 September 2014). "Official Charts Pop Gem #72: Amy Winehouse – Back To Black". Official Charts Company. Retrieved 7 April 2015. ^ Harris, Aisha (3 May 2013). "Hear Beyoncé and André 3000's "Back to Black"". Slate. Retrieved 8 August 2013. ^ Nero, Mark Edward. "Review: Amy Winehouse – "Back to Black"". About.com. Archived from the original on 11 April 2014. Retrieved 20 September 2014. ^ "100 Best Songs Of The 00s". NME. 29 May 2012. Retrieved 26 August 2018. ^ "Universal Republic Stars, Amy Winehouse and Mika, to Release Special Live DVDs in U.S. November 13" (Press release). Universal Republic Records. Business Wire. 2 December 2007. Retrieved 17 January 2015. ^ Swift, Jacqui (27 October 2006). "Wine, Woman and Song". The Sun. Archived from the original on 7 December 2008. Retrieved 10 December 2007. ^ Jones, Alan (22 October 2006). "Single and album sales fall". Music Week. Archived from the original on 2 December 2013. Retrieved 17 June 2015. ^ Jones, Alan (30 October 2006). "Mixed sales leave Robbie holding top spot on albums chart". Music Week. Archived from the original on 2 December 2013. Retrieved 17 June 2015. ^ Cohen, Jonathan (14 June 2007). "Rihanna's 'Umbrella' Reigns Again Atop Hot 100". Billboard. Retrieved 17 June 2015. ^ Cohen, Jonathan (21 June 2007). "Rihanna Fends Off Shop Boyz Again To Lead Hot 100". Billboard. Retrieved 17 June 2015. ^ a b c "Amy Winehouse". Official Charts Company. Retrieved 17 June 2015. ^ a b "Fans pay tribute to Amy Winehouse while JLS take 5th singles crown". Official Charts Company. 31 July 2011. Archived from the original on 28 June 2012. Retrieved 1 August 2011. ^ Ditzian, Eric (27 May 2009). "Amy Winehouse Barely Made It To 2007 MTV Movie Awards Performance". MTV News. Retrieved 17 June 2015. ^ Wilkes, Neil (24 June 2007). "Winehouse camps in style at Glastonbury". Digital Spy. Retrieved 7 February 2016. ^ "Amy Winehouse Birmingham show ends in chaos". Birmingham Mail. 15 November 2007. Retrieved 17 June 2015. ^ "Amy Winehouse fans revolt after shambolic gig". NME. 26 November 2007. Retrieved 26 August 2018. ^ "Amy Winehouse scraps all concerts". BBC News. 27 November 2007. Retrieved 17 June 2015. ^ a b "Back To Black by Amy Winehouse Reviews and Tracks". Metacritic. Retrieved 26 August 2018. ^ a b Rabin, Nathan (13 March 2007). "Amy Winehouse: Amy Winehouse". The A.V. Club. Retrieved 26 August 2018. ^ a b Hermes, Will (9 March 2007). "Amy Winehouse's 'Back To Black': EW Review". Entertainment Weekly. Retrieved 18 February 2016. ^ a b Lynskey, Dorian (27 October 2006). "Amy Winehouse, Back to Black". The Guardian. Retrieved 6 January 2014. ^ a b Gill, Andy (27 October 2006). "Album: Amy Winehouse". The Independent. Archived from the original on 13 January 2014. Retrieved 18 February 2016. ^ a b Nicholson, Stuart (15 October 2006). "Amy Winehouse, Back to Black". The Observer. Retrieved 6 January 2014. ^ a b Klein, Joshua (28 March 2007). "Amy Winehouse: Back to Black". Pitchfork. Retrieved 13 June 2010. ^ a b "Amy Winehouse: Back to Black". Q. No. 244. London. November 2006. p. 134. ISSN 0955-4955. ^ a b Hoard, Christian (6 February 2007). "Back to Black". Rolling Stone. Retrieved 26 August 2018. ^ a b Segal, Victoria (28 October 2006). "Amy Winehouse: Back to Black". The Times. Archived from the original on 6 July 2008. Retrieved 13 June 2010. ^ Cinquemani, Sal (2 March 2007). "Amy Winehouse: Back To Black". Slant Magazine. Retrieved 13 June 2010. ^ Pareles, Jon (12 March 2007). "Critics' Choice: New CDs". The New York Times. Retrieved 13 June 2010. ^ Frere-Jones, Sasha (3 March 2008). "Amy's Circus". The New Yorker. Retrieved 17 January 2015. ^ Christgau, Robert (June 2007). "Consumer Guide". MSN Music. Retrieved 13 June 2010 – via RobertChristgau.com. ^ Wolk, Douglas (April 2007). "Amy Winehouse: Back to Black". Blender. No. 57. New York. p. 121. ISSN 1534-0554. Archived from the original on 14 December 2007. Retrieved 18 February 2017. ^ Wolk, Douglas. "Amy Winehouse: Album Guide". Rolling Stone. Archived from the original on 4 May 2011. Retrieved 13 June 2010. ^ "Best of 2007". Metacritic. Archived from the original on 27 February 2009. Retrieved 23 January 2008. ^ Tyrangiel, Josh (9 December 2007). "Top 10 Albums". Time. Retrieved 17 January 2015. ^ Christgau, Robert; Fricke, David; Hoard, Christian; Sheffield, Rob (27 December 2007). "The Top 50 Albums of 2007". Rolling Stone. Archived from the original on 15 April 2009. Retrieved 20 December 2007. ^ Willman, Chris (21 December 2007). "The Best (and Worst) Albums of 2007". Entertainment Weekly. Archived from the original on 15 November 2012. Retrieved 2 December 2011. ^ "100 Best Albums of the 2000s". Rolling Stone. 18 July 2011. Retrieved 26 August 2018. ^ "500 Greatest Albums of All Time". Rolling Stone. 31 May 2012. Retrieved 26 August 2018. ^ Dimery, Robert; Lydon, Michael (2014). 1001 Albums You Must Hear Before You Die: Revised and Updated Edition. Universe. ISBN 0-7893-2074-6. ^ Houghton, Matt (15 February 2007). "Brit Awards 2007: Winners list". Digital Spy. Retrieved 7 February 2016. ^ "Klaxons scoop Mercury album prize". BBC News. 5 September 2007. Retrieved 17 January 2015. ^ a b "Grammy scorecard". Los Angeles Times. 2008. Archived from the original on 13 February 2009. Retrieved 2 October 2011. ^ "Pop, Dance, Traditional Pop and Rock". Los Angeles Times. 2008. Archived from the original on 13 February 2008. Retrieved 2 October 2011. ^ "Production, Non-Classical; Surround Sound; Production, Classical; Classical; Music Video". Los Angeles Times. 2008. Archived from the original on 13 February 2008. Retrieved 2 October 2011. ^ Jones, Alan (5 November 2006). "Girls Aloud topple Robbie from album summit". Music Week. Archived from the original on 24 March 2013. Retrieved 11 January 2014. ^ Jones, Alan (12 November 2006). "Album market bounces back". Music Week. Archived from the original on 2 December 2013. Retrieved 11 January 2014. ^ a b c "British album certifications – Amy Winehouse – Back to Black". British Phonographic Industry. Retrieved 5 April 2018. Select albums in the Format field. Select Platinum in the Certification field. Type Back to Black in the "Search BPI Awards" field and then press Enter. ^ Jones, Alan (15 January 2007). "Albums market down for third consecutive week". Music Week. Archived from the original on 3 December 2013. Retrieved 11 January 2014. ^ Jones, Alan (21 January 2007). "Winehouse holds on to album top spot". Music Week. Archived from the original on 2 December 2013. Retrieved 11 January 2014. ^ Jones, Alan (25 February 2007). "Mika loses chart grip". Music Week. Archived from the original on 2 December 2013. Retrieved 11 January 2014. ^ a b Jones, Alan (3 March 2008). "Mother's Day boosts album sales". Music Week. Archived from the original on 11 January 2014. Retrieved 11 January 2014. ^ "Official Albums Chart Top 100". Official Charts Company. 11–17 November 2007. Retrieved 12 March 2015. ^ "Official Albums Chart Top 100". Official Charts Company. 2–8 March 2008. Retrieved 12 March 2015. ^ "Official Albums Chart Top 100". Official Charts Company. 23–29 December 2007. Retrieved 12 March 2015. ^ "Top 40 Best Selling Albums 28 July 1956 – 14 June 2009" (PDF). British Phonographic Industry. Archived from the original (PDF) on 22 November 2009. Retrieved 9 September 2009. ^ "Winehouse and Lewis head charts". BBC News. 31 December 2007. Retrieved 17 January 2015. ^ a b Copsey, Rob (13 October 2018). "The UK's biggest studio albums of all time". Official Charts Company. Retrieved 13 October 2018. ^ Myers, Justin (18 July 2015). "Amy Winehouse's Back To Black in numbers". Official Charts Company. Retrieved 18 July 2015. ^ a b Copsey, Rob (4 July 2016). "The UK's 60 official biggest selling albums of all time revealed". Official Charts Company. Retrieved 21 July 2016. ^ Hasty, Katie (21 March 2007). "Musiq, Lloyd Usher Six Big Debuts Onto Album Chart". Billboard. ^ James, Sarah-Louise (29 March 2007). "Joss Beats Winehouse". MTV UK. Retrieved 17 January 2015. ^ Trust, Gary (20 February 2008). "Big Grammy Gains For Many; King of Pop Returns". Billboard. Retrieved 15 January 2014. ^ a b c "American album certifications – Amy Winehouse – Back to Black". Recording Industry Association of America. 12 March 2008. Retrieved 25 July 2011. If necessary, click Advanced, then click Format, then select Album, then click SEARCH. ^ a b "Year End Charts – Top Billboard 200". Billboard. 2007. Archived from the original on 23 September 2011. Retrieved 1 August 2011. ^ a b Tannenbaum, Rob (16 January 2015). "Billboard Cover: Mark Ronson on His Surprise No. 1 Hit, Amy Winehouse and His Neurotic Ways". Billboard. Retrieved 16 January 2015. ^ a b Sexton, Paul (3 April 2008). "Winehouse Notches Up 13th Week At Euro Chart Peak". Billboard. Retrieved 6 January 2014. ^ a b "Ultratop.be – Amy Winehouse – Back to Black" (in Dutch). Hung Medien. Retrieved 1 August 2011. ^ a b "Top Kombiniranih – Tjedan 8. 2008" [Top Combined – Week 8, 2008]. Top of the Shops (in Croatian). Archived from the original (PDF download) on 14 October 2013. Retrieved 27 January 2012. ^ a b c "Top-75 Albums Sales Chart – Εβδομάδα 35/2011" (in Greek). IFPI Greece. Archived from the original on 12 September 2011. Retrieved 7 September 2011. ^ a b "GFK Chart-Track Albums: Week 3, 2008". Chart-Track. IRMA. Retrieved 1 August 2011. ^ a b "Oficjalna lista sprzedaży :: OLiS - Official Retail Sales Chart". OLiS. Polish Society of the Phonographic Industry. Retrieved 1 August 2011. ^ "Download-LPs: "Stadtaffe" mit den höchsten Verkäufen". Media Control (in German). 17 November 2010. Archived from the original on 19 November 2010. Retrieved 25 July 2011. ^ a b McClintock, Pamela (25 April 2013). "Amy Winehouse Documentary In the Works". Billboard. Retrieved 31 January 2016. ^ Lawless, Jill (23 July 2011). "Troubled diva Amy Winehouse dead at 27". Yahoo! News. Archived from the original on 25 April 2016. Retrieved 9 August 2016. ^ Shedden, Iain (26 July 2011). "In death, Winehouse tops charts". The Australian. Archived from the original on 29 July 2011. Retrieved 27 July 2011. ^ "Tragic Amy Winehouse death makes first impact on Official Charts". Official Charts Company. 25 July 2011. Archived from the original on 30 September 2012. Retrieved 27 July 2011. ^ Jones, Alan (24 July 2011). "Adele still on top but UK album sales fall to 13-year low". Music Week. Archived from the original on 8 January 2014. Retrieved 12 January 2014. ^ Jones, Alan (8 August 2011). "Cher Lloyd leads first all-UK top five since 2007". Music Week. Archived from the original on 12 January 2014. Retrieved 12 January 2014. ^ Jones, Alan (15 August 2011). "Nero debut at one as Amy stays on top". Music Week. Archived from the original on 12 January 2014. Retrieved 12 January 2014. ^ Caulfield, Keith (26 July 2011). "Amy Winehouse's 'Back to Black' Re-Enters Top 10 on Billboard 200". Billboard. Retrieved 27 July 2011. ^ Christman, Ed (27 July 2011). "Amy Winehouse Sales, By the Numbers". Billboard. Retrieved 10 January 2014. ^ Caulfield, Keith (3 August 2011). "Eric Church Lands First No. 1 Album, Amy Winehouse Continues to Climb". Billboard. Retrieved 3 August 2011. ^ "Top 20 Albums". Music Canada. 27 July 2011. Archived from the original on 9 April 2012. Retrieved 28 July 2011. ^ Williams, John (27 July 2011). "Winehouse album sales skyrocket". Jam!. Archived from the original on 18 June 2015. Retrieved 17 June 2015. ^ Williams, John (3 August 2011). "Winehouse album sales go up again". Jam!. Archived from the original on 18 June 2015. Retrieved 17 June 2015. ^ a b "Austriancharts.at – Amy Winehouse – Back to Black" (in German). Hung Medien. Retrieved 1 August 2011. ^ "Top Stranih – Tjedan 30. 2011". Top of the Shops (in Croatian). Archived from the original (PDF download) on 24 December 2013. Retrieved 27 January 2012. ^ a b "Offiziellecharts.de – Amy Winehouse – Back to Black" (in German). GfK Entertainment Charts. Retrieved 1 August 2011. ^ a b "Dutchcharts.nl – Amy Winehouse – Back to Black" (in Dutch). Hung Medien. Retrieved 1 August 2011. ^ "Oficjalna lista sprzedaży". OLiS. 16 August 2011. Retrieved 27 January 2012. ^ a b "Swisscharts.com – Amy Winehouse – Back to Black". Hung Medien. Retrieved 1 August 2011. ^ a b "Italiancharts.com – Amy Winehouse – Back to Black". Hung Medien. Retrieved 1 August 2011. ^ Cairns, Dan (26 July 2009). "The rise of a new wave of female singers". The Sunday Times. Archived from the original on 15 June 2011. Retrieved 31 May 2014. ^ Farber, Jim (29 March 2011). "British music invasion triggered by Amy Winehouse now includes Eliza Doolittle, Adele, Rumer". New York Daily News. Retrieved 23 July 2011. ^ "Amy Winehouse's 'Back To Black' documentary is a reminder of her supreme talent". NME. 19 September 2018. Retrieved 12 October 2018. ^ "New Amy Winehouse Back to Black Documentary Announced". Pitchfork. Retrieved 12 October 2018. ^ Snapes, Laura (12 October 2018). "Hologram of Amy Winehouse set for 2019 worldwide tour". The Guardian. Retrieved 12 October 2018. ^ "Amy Winehouse 'Back to Black' Documentary Announced: Watch the Trailer". Billboard. Retrieved 12 October 2018. ^ "Amy Winehouse 'Back to Black' Documentary Offers Revealing Commentary From Mark Ronson, Salaam Remi & More". Billboard. Retrieved 12 October 2018. ^ "A new documentary on Amy Winehouse's Back to Black is in the works". The Fader. Retrieved 12 October 2018. ^ Dazed (20 September 2018). "A new Amy Winehouse documentary about Back to Black is coming". Dazed. Retrieved 12 October 2018. ^ "New Amy Winehouse Documentary 'Back to Black' Announced". Spin. 19 September 2018. Retrieved 12 October 2018. ^ Reed, Ryan (19 September 2018). "Amy Winehouse: Previously Unseen Concert Highlights 'Back to Black' Doc DVD". Rolling Stone. Retrieved 12 October 2018. ^ "Back to Black by Amy Winehouse". iTunes Store (US). Archived from the original on 11 September 2010. Retrieved 2 September 2011. ^ a b "Back To Black: Amy Winehouse". Amazon (US). Retrieved 26 August 2018. ^ "Back To Black : Amy Winehouse". HMV Japan. Retrieved 6 January 2014. ^ a b "Back to Black (Ltd. Sonderedition inkl. 5 Live-Tracks): Amy Winehouse". Amazon (Germany) (in German). Retrieved 26 August 2018. ^ a b "Amy Winehouse Store – Back To Black (Deluxe)". Getmusic (Australia). Archived from the original on 14 December 2011. Retrieved 18 October 2011. ^ a b "Amy Winehouse | Back To Black (Deluxe Edition)". Universal Music Germany (in German). Archived from the original on 18 June 2015. Retrieved 18 October 2011. ^ バック・トゥ・ブラック~デラックス・エディション[+ボーナス・ビデオ] [Back To Black – Deluxe Edition [+ bonus video]]. Universal Music Japan (in Japanese). Retrieved 11 January 2014. ^ a b "Back To Black Live From Amsterdam, Amy Winehouse". bol.com (in Dutch). Archived from the original on 17 October 2013. Retrieved 7 January 2013. ^ "Australiancharts.com – Amy Winehouse – Back to Black". Hung Medien. Retrieved 1 August 2011. ^ "Ultratop.be – Amy Winehouse – Back to Black" (in French). Hung Medien. Retrieved 1 August 2011. ^ "Amy Winehouse Chart History (Canadian Albums)". Billboard. Retrieved 1 August 2011. ^ "Czech Albums – Top 100". ČNS IFPI. Note: On the chart page, select 200812 on the field besides the word "Zobrazit", and then click over the word to retrieve the correct chart data. Retrieved 22 December 2016. ^ "Danishcharts.dk – Amy Winehouse – Back to Black". Hung Medien. Retrieved 1 August 2011. ^ "Amy Winehouse: Back to Black" (in Finnish). Musiikkituottajat – IFPI Finland. Retrieved 22 December 2016. ^ "Lescharts.com – Amy Winehouse – Back to Black". Hung Medien. Retrieved 1 August 2011. ^ "Top 40 album DVD és válogatáslemez-lista – 2008. 13. hét" (in Hungarian). MAHASZ. Retrieved 12 April 2015. ^ バック・トゥ・ブラック | エイミー・ワインハウス [Back to Black | Amy Winehouse] (in Japanese). Oricon. Retrieved 17 January 2015. ^ "Amy Winehouse – Back To Black". mexicancharts.com. Archived from the original on 8 November 2011. Retrieved 1 August 2011. ^ "Charts.org.nz – Amy Winehouse – Back to Black". Hung Medien. Retrieved 1 August 2011. ^ "Norwegiancharts.com – Amy Winehouse – Back to Black". Hung Medien. Retrieved 1 August 2011. ^ "Portuguesecharts.com – Amy Winehouse – Back to Black". Hung Medien. Retrieved 1 August 2011. ^ Первый осенний [The first autumn]. Lenta.ru (in Russian). 16 September 2011. Retrieved 27 January 2012. ^ "Official Scottish Albums Chart Top 100". Official Charts Company. Retrieved 31 July 2015. ^ "Spanishcharts.com – Amy Winehouse – Back to Black". Hung Medien. Retrieved 1 August 2011. ^ "Swedishcharts.com – Amy Winehouse – Back to Black". Hung Medien. Retrieved 1 August 2011. ^ "Official Albums Chart Top 100". Official Charts Company. Retrieved 31 July 2015. ^ "Official R&B Albums Chart Top 40". Official Charts Company. Retrieved 31 July 2015. ^ "Amy Winehouse Chart History (Billboard 200)". Billboard. Retrieved 1 August 2011. ^ "Amy Winehouse Chart History (Top Alternative Albums)". Billboard. Retrieved 1 August 2011. ^ "Amy Winehouse Chart History (Top R&B/Hip-Hop Albums)". Billboard. Retrieved 1 August 2011. ^ "Bestenlisten – 00er-Album". austriancharts.at (in German). Retrieved 1 August 2011. ^ "Top Albums of The Decade: 2000s". everyHit.com. Retrieved 1 August 2011. ^ "Greatest of All Time Billboard 200 Albums". Billboard. Retrieved 28 December 2016. ^ "End of Year Album Chart Top 100 – 2006". Official Charts Company. Retrieved 12 March 2015. ^ "ARIA Charts – End Of Year Charts – Top 100 Albums 2007". Australian Recording Industry Association. Retrieved 1 August 2011. ^ "Jahreshitparade Alben 2007". austriancharts.at (in German). Retrieved 7 February 2016. ^ "Jaaroverzichten 2007 – Albums" (in Dutch). Ultratop. Retrieved 1 August 2011. ^ "Rapports Annuels 2007 – Albums" (in French). Ultratop. Retrieved 1 August 2011. ^ "Jaaroverzichten – Album 2007". dutchcharts.nl (in Dutch). Retrieved 1 August 2011. ^ "Year End Charts – European Top 100 Albums". Billboard. 2007. Archived from the original on 25 February 2009. Retrieved 1 August 2011. "Myydyimmät kotimaiset albumit vuonna 2007" (in Finnish). Musiikkituottajat – IFPI Finland. Retrieved 12 August 2013. "Myydyimmät ulkomaiset albumit vuonna 2007" (in Finnish). Musiikkituottajat – IFPI Finland. Retrieved 12 August 2013. ^ "Classement Albums – année 2007" (in French). Syndicat National de l'Édition Phonographique. Archived from the original on 25 September 2012. Retrieved 1 August 2011. ^ "Top 100 Album-Jahrescharts – 2007" (in German). Offizielle Deutsche Charts. Retrieved 17 June 2015. ^ "Összesített album- és válogatáslemez-lista – chart-pozíció alapján – 2007" (in Hungarian). MAHASZ. Retrieved 1 August 2011. ^ "Best of 2007 – Albums". Irish Recorded Music Association. Retrieved 17 January 2015. ^ "Classifiche Annuali 2007 FIMI-AC Nielsen: al primo posto Eros Ramazzotti con "E2"" (in Italian). Federazione Industria Musicale Italiana. 10 January 2008. Retrieved 7 February 2016. Click on "Scarica allegato" to download the zipped file containing the year-end chart files. ^ "Top Selling Albums of 2007". Recorded Music NZ. Retrieved 6 January 2014. ^ "Årslista Album – År 2007" (in Swedish). Sverigetopplistan. Retrieved 1 August 2011. ^ "Swiss Year-End Charts 2007". swisscharts.com. Retrieved 17 January 2015. ^ a b "End of Year Album Chart Top 100 – 2007". Official Charts Company. Retrieved 12 March 2015. ^ "Year End Charts – Top R&B/Hip-Hop Albums". Billboard. 2007. Archived from the original on 4 October 2012. Retrieved 1 August 2011. ^ "Top 50 Global Best Selling Albums for 2007" (PDF). International Federation of the Phonographic Industry. Archived from the original (PDF) on 30 May 2009. Retrieved 7 August 2011. ^ "ARIA Charts – End Of Year Charts – Top 100 Albums 2008". Australian Recording Industry Association. Retrieved 1 August 2011. ^ "Jahreshitparade Alben 2008". austriancharts.at (in German). Retrieved 7 February 2016. ^ "Jaaroverzichten 2008 – Albums" (in Dutch). Ultratop. Retrieved 1 August 2011. ^ "Rapports Annuels 2008 – Albums" (in French). Ultratop. Retrieved 1 August 2011. ^ "20 CDs mais vendidos – 2008" (in Portuguese). Associação Brasileira dos Produtores de Discos. Archived from the original on 18 May 2015. Retrieved 24 May 2015. ^ "Godišnja Top Lista Kombiniranih za 2008" [Annual List of Top Combined Albums for 2008]. Top of the Shops (in Croatian). Archived from the original on 23 December 2016. Retrieved 9 February 2016. ^ "Album 2008 Top-100". Hitlisten.NU (in Danish). Archived from the original on 19 July 2011. Retrieved 6 January 2014. ^ "Jaaroverzichten – Album 2008". dutchcharts.nl (in Dutch). Retrieved 1 August 2011. ^ a b "Year End Charts – European Top 100 Albums". Billboard. 2008. Archived from the original on 4 October 2012. Retrieved 1 August 2011. "Myydyimmät kotimaiset albumit vuonna 2008" (in Finnish). Musiikkituottajat – IFPI Finland. Retrieved 12 August 2013. "Myydyimmät ulkomaiset albumit vuonna 2008" (in Finnish). Musiikkituottajat – IFPI Finland. Retrieved 12 August 2013. ^ "Classement Albums – année 2008" (in French). Syndicat National de l'Édition Phonographique. Archived from the original on 5 December 2013. Retrieved 1 August 2011. ^ "Top 100 Album-Jahrescharts – 2008" (in German). Offizielle Deutsche Charts. Retrieved 17 June 2015. ^ "Annual Charts – Year 2008: Top 50 Ελληνικών και Ξένων Aλμπουμ" [Annual Charts – Year 2008: Top 50 Greek and Foreign Albums] (in Greek). IFPI Greece. Archived from the original on 21 July 2011. Retrieved 1 August 2011. ^ "Annual Charts – Year 2008: Top 50 Ξένων Aλμπουμ" [Annual Charts – Year 2008: Top 50 Foreign Albums] (in Greek). IFPI Greece. Archived from the original on 21 July 2011. Retrieved 1 August 2011. ^ "Összesített album- és válogatáslemez-lista – chart-pozíció alapján – 2008" (in Hungarian). MAHASZ. Retrieved 1 August 2011. ^ "Best of 2008 – Albums". Irish Recorded Music Association. Retrieved 17 January 2015. ^ "Classifiche ufficiali degli Album e dei DVD musicali più venduti e dei singoli più scaricati dalla rete nel 2008" (in Italian). Federazione Industria Musicale Italiana. 13 January 2009. Retrieved 7 February 2016. Click on "Scarica allegato" to download the zipped file containing the year-end chart files. ^ "Los Más Vendidos 2008" (PDF) (in Spanish). Asociación Mexicana de Productores de Fonogramas y Videogramas. Archived from the original (PDF) on 15 February 2010. Retrieved 22 January 2014. ^ "Top Selling Albums of 2008". Recorded Music NZ. Retrieved 6 January 2014. ^ a b "Top 50 Albumes 2008" (PDF) (in Spanish). Productores de Música de España. Archived from the original (PDF) on 26 March 2010. Retrieved 1 August 2011. ^ "Årslista Album – År 2008" (in Swedish). Sverigetopplistan. Retrieved 1 August 2011. ^ "Swiss Year-End Charts 2008". swisscharts.com. Retrieved 17 January 2015. ^ a b "End of Year Album Chart Top 100 – 2008". Official Charts Company. Retrieved 12 March 2015. ^ "Year End Charts – Top Billboard 200". Billboard. 2008. Archived from the original on 4 October 2012. Retrieved 1 August 2011. ^ "Alternative Albums – Year-End 2008". Billboard. Retrieved 17 January 2015. ^ "Year End Charts – Top R&B/Hip-Hop Albums". Billboard. 2008. Archived from the original on 4 October 2012. Retrieved 1 August 2011. ^ "Top 50 Global Best Selling Albums for 2008" (PDF). International Federation of the Phonographic Industry. Archived from the original (PDF) on 7 April 2009. Retrieved 7 August 2011. ^ "Year End Charts – European Top 100 Albums". Billboard. 2009. Archived from the original on 3 October 2012. Retrieved 1 August 2011. ^ "Top 50 Albumes 2009" (PDF) (in Spanish). Productores de Música de España. Archived from the original (PDF) on 26 March 2010. Retrieved 8 May 2015. ^ "UK Year-End Charts 2009" (PDF). UKChartsPlus. p. 7. Retrieved 6 May 2015. ^ "ARIA Charts – End Of Year Charts – Top 100 Albums 2011". Australian Recording Industry Association. Retrieved 4 January 2012. ^ "Jahreshitparade Alben 2011". austriancharts.at (in German). Retrieved 7 February 2016. ^ "Jaaroverzichten 2011 – Albums" (in Dutch). Ultratop. Retrieved 29 December 2011. ^ "Rapports Annuels 2011 – Albums" (in French). Ultratop. Retrieved 29 December 2011. ^ "Top 20 CDs 2011" (PDF) (in Portuguese). Associação Brasileira dos Produtores de Discos. p. 10. Archived from the original (PDF) on 7 October 2012. Retrieved 7 October 2012. ^ "Jaaroverzichten – Album 2011". dutchcharts.nl (in Dutch). Retrieved 29 December 2011. ^ "Top 100 Album-Jahrescharts – 2011" (in German). Offizielle Deutsche Charts. Retrieved 17 June 2015. ^ "Classifiche annuali Fimi-GfK: Vasco Rossi con "Vivere o Niente" e' stato l'album piu' venduto nel 2011" (in Italian). Federazione Industria Musicale Italiana. 16 January 2012. Retrieved 6 May 2015. Click on "Scarica allegato" to download the zipped file containing the year-end chart files. ^ "Los Más Vendidos 2011" (PDF) (in Spanish). Asociación Mexicana de Productores de Fonogramas y Videogramas. Archived from the original (PDF) on 31 January 2012. Retrieved 19 January 2012. ^ "Top Selling Albums of 2011". Recorded Music NZ. Retrieved 6 January 2014. ^ "Swiss Year-End Charts 2011". swisscharts.com. Retrieved 17 January 2015. ^ "End of Year Album Chart Top 100 – 2011". Official Charts Company. Retrieved 12 March 2015. ^ "2011 Year End Charts – Top Billboard 200 Albums". Billboard. Archived from the original on 11 January 2012. Retrieved 19 January 2014. ^ "Global Top 50 Albums of 2011" (PDF). International Federation of the Phonographic Industry. p. 43. Retrieved 19 January 2014. ^ "Jaaroverzichten 2012 – Albums" (in Dutch). Ultratop. Retrieved 6 January 2014. ^ "Jaaroverzichten – Album 2012". dutchcharts.nl (in Dutch). Retrieved 27 December 2012. ^ "Top 100 Album Combined – Classifica annuale (dal 2 Gennaio 2012 al 30 Dicembre 2012)" (PDF) (in Italian). Federazione Industria Musicale Italiana. p. 3. Archived (PDF) from the original on 16 January 2013. Retrieved 16 January 2013 – via TV Sorrisi e Canzoni. ^ "UK Year-End Charts 2012" (PDF). UKChartsPlus. p. 8. Retrieved 6 May 2015. ^ "Classifiche "Top of the Music" 2015 FIMI-GfK: La musica italiana in vetta negli album e nei singoli digitali" (in Italian). Federazione Industria Musicale Italiana. Retrieved 9 January 2016. Click on "Scarica allegato" to download the zipped file containing the year-end chart files. ^ "End of Year Album Chart Top 100 – 2015". Official Charts Company. Retrieved 9 January 2018. ^ ""Top of the Music" FIMI–GfK 2016: Le uniche classifiche annuali complete" (in Italian). Federazione Industria Musicale Italiana. 9 January 2017. Retrieved 29 January 2017. Click on "Scarica allegato" to download the zipped file containing the year-end chart files. ^ "W 2016 roku najlepiej sprzedającym się albumem było "Życie po śmierci" O.S.T.R." (in Polish). Polish Society of the Phonographic Industry. 12 January 2017. Retrieved 14 January 2017. ^ "End of Year Album Chart Top 100 – 2016". Official Charts Company. Retrieved 9 January 2018. ^ "End of Year Album Chart Top 100 – 2017". Official Charts Company. Retrieved 9 January 2018. ^ "Austrian album certifications – Amy Winehouse – Back to Black" (in German). IFPI Austria. 16 November 2011. Retrieved 26 November 2011. Enter Amy Winehouse in the field Interpret. Enter Back to Black in the field Titel. Select album in the field Format. Click Suchen. ^ "Ultratop − Goud en Platina – albums 2008". Ultratop. Hung Medien. 24 October 2008. Retrieved 1 August 2011. ^ "Brazilian album certifications – Amy Winehouse – Back to Black" (in Portuguese). Associação Brasileira dos Produtores de Discos. Retrieved 25 July 2011. ^ "Canadian album certifications – Amy Winehouse – Back to Black". Music Canada. 21 December 2007. Retrieved 1 August 2011. ^ "Guld og platin i maj" (in Danish). IFPI Denmark. 19 June 2008. Archived from the original on 17 January 2015. Retrieved 16 August 2011. ^ a b "Amy Winehouse" (in Finnish). Musiikkituottajat – IFPI Finland. Retrieved 25 July 2011. ^ "French album certifications – Amy Winehouse – Back to Black" (in French). Syndicat National de l'Édition Phonographique. 20 December 2007. Retrieved 26 August 2018. ^ "Gold-/Platin-Datenbank (Amy Winehouse; 'Back to Black')" (in German). Bundesverband Musikindustrie. Retrieved 1 August 2011. ^ "Adatbázis – Arany- és platinalemezek – 2008" (in Hungarian). MAHASZ. Retrieved 16 April 2014. ^ "Italian album certifications – Amy Winehouse – Back to Black" (in Italian). Federazione Industria Musicale Italiana. Retrieved 2 January 2019. Select "2018" in the "Anno" drop-down menu. Select "Back to Black" in the "Filtra" field. Select "Album e Compilation" under "Sezione". ^ "Dutch album certifications – Amy Winehouse – Back to Black" (in Dutch). Nederlandse Vereniging van Producenten en Importeurs van beeld- en geluidsdragers. Retrieved 26 August 2018. Enter Back to Black in the "Artiest of titel" box. ^ "New Zealand album certifications – Amy Winehouse – Back to Black". Recorded Music NZ. 7 November 2011. Retrieved 21 January 2012. ^ "IFPI Norsk platebransje Trofeer 1993–2011" (in Norwegian). IFPI Norway. Retrieved 7 January 2014. ^ "Polish album certifications – Amy Winehouse – Back to Black" (in Polish). Polish Society of the Phonographic Industry. 3 September 2008. Retrieved 17 January 2015. ^ "Galardões 2008" [Awards 2008] (in Portuguese). Associação Fonográfica Portuguesa. Archived from the original on 6 October 2011. Retrieved 1 August 2011. ^ "Russian album certifications – Amy Winehouse – Back to Black" (in Russian). National Federation of Phonogram Producers (NFPF). Retrieved 12 December 2010. ^ "Guld- och Platinacertifikat − År 2008" (PDF) (in Swedish). IFPI Sweden. 1 February 2008. Retrieved 1 August 2011. ^ "The Official Swiss Charts and Music Community: Awards (Amy Winehouse; 'Back to Black')". IFPI Switzerland. Hung Medien. Retrieved 31 July 2011. ^ "2009 MÜ-YAP Müzik Endüstrisi Ödülleri" [2009 MÜ-YAP Music Industry Awards] (in Turkish). Turkish Phonographic Industries Society. Archived from the original on 5 February 2012. Retrieved 25 July 2011. ^ "Winehouse, Amy – Back to Black". Tower Records Ireland. Retrieved 18 October 2011. ^ "Amy Winehouse: Back To Black". HMV. Archived from the original on 15 July 2012. Retrieved 18 October 2011. ^ "Back To Black – Amy Winehouse". Universal Music Poland (in Polish). Retrieved 12 January 2014. ^ "Back to Black: Amy Winehouse". Amazon (Germany) (in German). Retrieved 26 August 2018. ^ "Back to Black by Amy Winehouse". HMV Canada. Archived from the original on 18 June 2015. Retrieved 17 January 2015. ^ "Certifications Albums Double Platine – année 2007". Syndicat National de l'Édition Phonographique (in French). 20 December 2007. Archived from the original on 16 April 2014. Retrieved 16 April 2014. ^ "Amy Winehouse – Back to Black". IBS.it (in Italian). Archived from the original on 18 June 2015. Retrieved 18 October 2011. ^ "Amy Winehouse Store – Back To Black". Getmusic (Australia). Archived from the original on 26 March 2012. Retrieved 18 October 2011. ^ a b "Discography – Amy Winehouse". Universal Music Japan (in Japanese). Archived from the original on 7 January 2014. Retrieved 6 January 2014. ^ "Back To Black (Dlx Ltd Ed): Amy Winehouse". Amazon (Canada). Retrieved 26 August 2018. ^ "Winehouse,amy – Back To Black[deluxe Ed]". Tower Records Ireland. Archived from the original on 2 June 2013. Retrieved 18 October 2011. ^ "Amy Winehouse: Back To Black: Deluxe Edition: 2cd". HMV. Archived from the original on 15 July 2012. Retrieved 18 October 2011. ^ "Amy Winehouse – Back to Black (Deluxe)". IBS.it (in Italian). Archived from the original on 18 June 2015. Retrieved 18 October 2011. Brackett, Donald (2016). Back to Black: Amy Winehouse's Only Masterpiece. Hal Leonard Corporation. ISBN 1-617-13679-4. Retrieved 26 August 2018 – via Google Books. This page was last edited on 12 February 2019, at 21:18 (UTC).